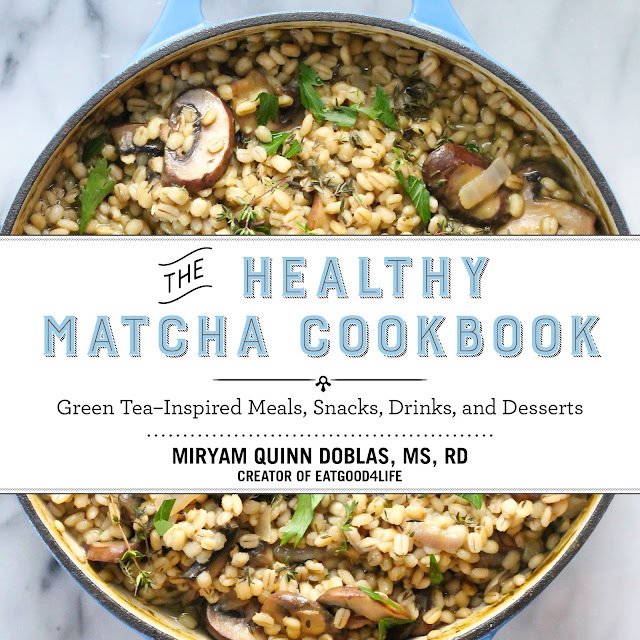 There are many things to like about Miryam Quinn-Doblas's The Healthy Matcha Cookbook. One, the book is hard cover and has a dust jacket illustrated with a photo of a delicious looking Barley Risotto seasoned with 2 teaspoons of matcha. I have not yet made this recipe but perhaps I should, soon; after all, it's the cover photo! Two, the pages are stain resistant. I don't have to worry about wiping every bit of spice or sauce off my fingers before turning the page, though the book is designed such that I don't have to, which brings me to three. Each recipe and it's accompanying photo are in a facing pages layout. Four, the focus of the book is the recipes. Five, in keeping with the emphasis on recipes, there is relevant information about matcha as well as the other ingredients used to prepare the dishes. Six, there is a Resources chapter; it's short but practical. And seven, the book has a handy conversion chart for metric to imperial and Fahrenheit to Celsius. One more thing, the index is logically designed. There are four categories of recipes: Energizing Breakfasts, Healthy Snacks, Lean Meals, and Decadent Desserts. I chose a dessert (Chocolate Chunk Cookies) and two breakfast recipes (Breakfast Frittata and Breakfast Parfaits). The frittata could work as an entree or "lean meal". The cookies, and many of the desserts, contain coconut oil. I stored them in the refrigerator to prevent the coconut oil from going stale. I liked the cookies, especially warm. The coconut oil was the predominant flavor so if you are not a fan of coconut oil, this might not be the cookie recipe for you. The egg dish was also good. I didn't make it to the recipe, though. One change was that I used cumin because I did not have tumeric (the recipe calls for 1 teaspoon). The combination of matcha and cumin was delicious. The matcha added a deep green color and flavor -- similar to fresh spinach, and not baby spinach -- to the eggs. My favorite of the three recipes was the parfait. Again, I strayed slightly away from the recipe. I used regular whole milk and not plan Greek yogurt but this recipe is versatile so I think using a yogurt of your choice, or fresh fruit of your choice (as suggested by Miryam) will produce tasty results. The best part of this recipe was the "matcha yogurt" as I call it of yogurt, maple syrup, and matcha. I will definitely use this matcha yogurt in other recipes. 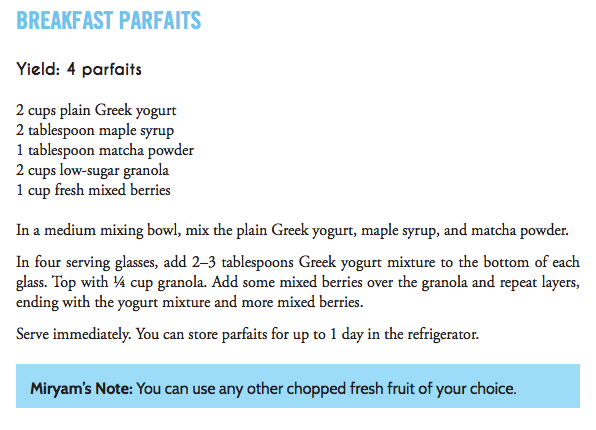 And thanks to Skyhorse Publishing, I am sharing the full Breakfast Parfait recipe below. You can find Miryam and her recipes at EatGood4Life. She's on lots of social media platforms, too. The Eat Good 4 Life Pinterest boards are a delight. The Healthy Matcha Cookbook: Green Tea Inspired Meals, Snacks, Drinks, and Desserts is sold on Amazon (affiliate link) as well as via Skyhorse Publishing. A review copy of The Healthy Matcha Cookbook was provided by Skyhorse Publishing. Recipes were prepared with culinary grade matcha courtesy of Mizuba Tea Co.